^ a b McClelland, Aaron D. "Government of Florence." Quattrocento Project. ^ Staley, 1906, p. 601. ^ a b c d Staley, 1906, p. 275. ^ Staley, 1906, p. 606. ^ First mention in documents as the "Calimala Guild". See Staley, 1906, p. 601. ^ a b The consuls of the Lana, Calimala, and Seta guilds signed documents in 1192, which are the oldest extant records of their type. See Staley, 1906, p. 601. ^ Staley, 1906, p. 602. ^ First explicit mention of a "Guild of Bankers" is in 1201. See Staley, 1906, p. 173, 601. ^ Earliest mention of "Arte de' Beccai". Earliest mention of "butcher" in the archives of Florence is in 1110. See Staley, 1906, p. 297. ^ Staley, 1906, pp. 307-308. ^ Staley, 1906, p. 315. ^ Staley, 1906, p. 325. ^ Rigattieri (Retail-Dealers) and Linaiuoli (Linen Drapers) were founded separately in 1266. See Staley, 1906, p. 345. ^ a b Staley, 1906, p. 364. ^ a b Staley, 1906, p. 394. ^ Staley, 1906, p. 378. ^ Staley, 1906, pp. 404-405. ^ Staley, 1906, p. 419. ^ Staley, 1906, p. 426. ^ Staley, 1906, p. 437. Hughes, Anthony. "'An Academy for Doing'. I: The Accademia del Disegno, the Guilds and the Principate in Sixteenth-Century Florence." Oxford Art Journal, vol. 9, no. 1. (1986), pp. 3–10. Jack, Mary Ann. "The Accademia del Disegno in Late Renaissance Florence." In: Sixteenth Century Journal, vol. 7, no. 2. (Oct., 1976), pp. 3–20. Mather, Rufus Graves. "Documents Mostly New Relating to Florentine Painters and Sculptors of the Fifteenth Century." In: The Art Bulletin, vol. 30, no. 1. (Mar., 1948), pp. 20–65. Staley, John Edgcumbe. 1906. 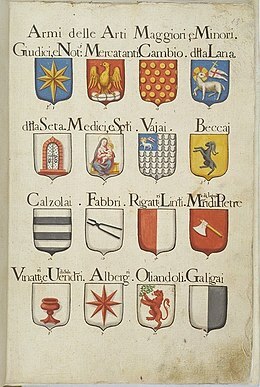 The Guilds of Florence. Methuen & Co.